Children like to move! Now you can help them move in worship to the songs from Hi Godwith this book of gestures. Find 16 inspiring songs from the Hi God collections that introduce children to God with enjoyable, meaningful and easy to learn lyrics. Compliment this resource with the gesture book for a deeper learning experience. 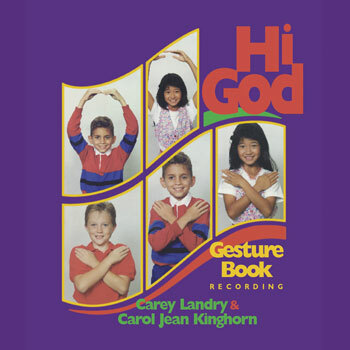 The book contains clear photographs of children demonstrating gestures to 16 of the songs from the Hi God collections. The gestures, motions, signs and suggested choreography flow freely and are easy for children to learn. Why should teachers, catechists and parents involve music and motion while teaching children to love God and others? Incorporating activities that involve all the senses can make learning more memorable. When singing and dancing, children will not only be more focused but will also experience a deeper meaning with the words they sing. The music in this first volume includes favorites such as "His Banner Over Us Is Love" and "Neighbors (Jesu, Jesu)." The accompanying recording makes these two products a great source of ideas for liturgy with children and catechesis.